Few people would think that my life provided any poignance or intrigue worthy of popular attention. How much less do I exemplify the sort of haunting, twisted narrative characteristic of Ira Glass’s This American Life ? Yet last week, Margaret and I played our parts in an eerie tale of extraordinary synchronicity, or coincidence, or Providence. It all started at our wedding. 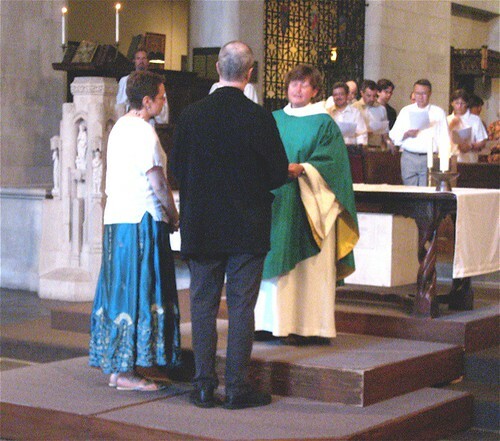 Margaret and I had met at Bowdoin College, a mere two weeks into her collegiate career, while I was a senior; we waited to get married until she graduated four years later. Since we were married relatively near Bowdoin, a knot of our classmates crowded the wedding and reception (we had one of those alumni-magazine photos taken), and we received various Bowdoin-themed wedding presents, including a snazzy mirror (like this one) that has adorned our front hall or first-floor rest room in every abode where we’ve lived since then. OK, enough stage-setting: two weeks ago, while we were cleaning up the first floor in anticipation of the twenty-fifth anniversary of our wedding (hence, the twenty-fifth anniversary of receiving the gift Bowdoin mirror) Saturday pre-reaffirmation party — while no one was anywhere near the first-floor bathroom — the mirror spontaneously crashed to the floor. After 25 years of reflecting our life together, the mirror gave out and shattered. But not precisely, because the mirror itself didn’t break. Nor, in fact, did the painted-glass illustration of the Bowdoin campus. In fact, it was impossible to tell exactly what was broken (apart from the sawtooth hanging apparatus), because all the broken glass was contained within the protective paper covering that sealed in the back of the mirror. Well, it was an exceptionally busy day, so we set the mirror aside and worked on the other areas of the public rooms. We enjoyed a spectacular lasagna feast with our wonderful friends, and went ahead with the reaffirmation on Sunday morning. Having set the mysteriously broken mirror aside in the hurly-burly of occasions and visitors, we tracked it down again a week later and brought it to our customary framery. They agreed with our suspicion, that a glass backing layer had splintered without affecting the mercury mirror. When they peeled away the paper protective layer, though, they found no backing at all for the mirror. 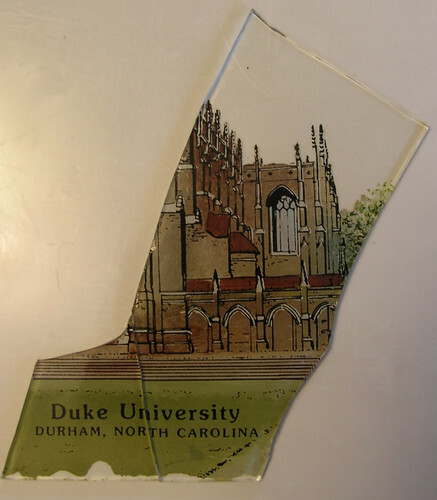 Instead, the broken glass seemed to have been confined to the upper portion of the mirror: the painting of the college. But the picture of Bowdoin on the front of the mirror was intact; perhaps there had been a backing layer for the painting? In other words: on our wedding day, we were given a mirror with a painting of our college alma mater, behind which picture lay a second painted image — this one, of an institution in which I would enroll five years later, and Margaret twenty-two years later. The only way this could be weirder would involve a hidden connection to Yale Divinity School (AKMA ’86 and ’87) and Seabury (Margaret, ’03), but since only one of us attended each of those schools, I guess that the mysterious force of serendipity didn’t see fit to add those to our mirror. Ira Glass, you know where to contact me. I’m not sure whether it was a short planning meeting that lasted painfully long, or a a long planning meeting that went by fast. The “long” part involved sitting in on deliberations that bear relatively little upon my areas of strongest interest; I’m not part of the “affinity group” or “community of practice” that ATS wanted to consult (educational technologists). I just don’t have much to contribute to conference planning oriented toward enhancing the cooperation and coordination of seminary-based IT/ET professionals. That’s entirely OK, too. I don’t need to be in on that, and I’m confident that such planning can proceed smoothly and effectively without my input. The exciting parts that went by in a blink involved, unsurprisingly, the stuff that does animate me. At several intervals, the concerns of educational technologists converged with the concerns of technological pedagogues, and those times came as refreshing gasps of vital air. For quite intelligible reasons, the get-together concentrated on practical concerns such as encouraging seminary presidents, deans, and CFOs to plan and budget appropriately for the maintenance of their information infrastructure, and for supporting Ed-Techs in their work. The future that the planning meeting examined and prepared for was very much like the present, only with the benefit of advice from an elite cadre of Educational technologists. With mountains of respect for the work of ed-techs — I’ve filled that role more than once on a casual basis, and it’s a challenging role indeed — my perspective as a pedagogue immersed in the digital world convinces me that we need just as much, and perhaps more, to prepare for a pedagogical environment that has already changed significantly while seminaries have stood aside, and that will change more, more rapidly. The items of special concern to one constituency in our planning meeting stayed fixed at the Web 1.0, or generously at the Web 1.5 level — whereas the digital natives who will very soon be entering seminary take Web 2.0 for granted, and some have begun messing with more adventuresome instantiations of the digital environment. To a student who’s active with Facebook and Flickr, who plays in Second Life or Warcraft, who’s comfortable chatting in text, conversing over a shared audio server (such as Ventrillo or TeamSpeak), at the same time she’s flying to her island in Second Life, a seminary’s installation of BlackBoard not only represents archaic technology, it represents determined irrelevance to her way of daily life. The sessions of the planning committee reflected plausible preparations for theo-educational ecology that’s gradually disappearing, and efforts to refine our obsolescent technologies oblige us to squander energy on sustaining the cultural ecology within which those technologies make sense. We all, pretty much, agreed on that — and went ahead with a sensible plan for lobbying administrators to budget more soundly, and for enhancing support for ed-techs. Im spending the day at a planning meeting relative to technology and theological education, hosted by the Association of Theological Schools. Some of the folks I already know, others new to me. If everything works out right, we’ll be hosting a conference, maybe two, about the ways technology can support the missions of ATS member schools. I suspect I’m a little left-field-ish for them — many of the people around the table are Big Proprietary System customers — but they invited me to the table, so we’ll see what comes of this. Cheers to Frank, who has been named an Honorary Fellow of Sociology at the University of Wisconsin! Ray Larabie, of Typodermic Fonts, has put together a carefully-selected treasury of typefaces for casual use — some are free, and others inexpensive. For what it’s worth, I can sum up my typographic advice to most people and small organizations (such as churches) in two principles. Select one serif body-copy typeface family and one sans-serif headline face family for normal use. Stick with them. Choose something that’s not the most common packaged-with-your-OS typeface; if you can’t afford to buy a typeface, download Frantisek Storm’s Lido STF family. It’s free, and professional, and it’s distinguishable from Times Roman. Use other decorative typefaces sparingly, and use them deliberately to mean something visually — don’t just scatter them around ornamentally. Where you need to use several different typefaces, use type that harmonizes with the other typeface(s) in use. For a while when I was a kid, I thought that the idea was to wear as many different colors at once as was possible. The more different typefaces you use at once, the more likely it is that you’ll look as absurd as I did. That’s it. If you use type sparingly, consistently, carefully, deliberately, you will avoid many of the most painful design errors that amateur typographers commit. Of course there are situations that defy these rules of thumb. Sometimes one wants a garish patchwork of type thrown together higgledy-piggledy, or an eye-searing contrast between one’s blackletter body copy and Art Deco headers. But really, how often? Never, if you’re putting together business correspondence or a church bulletin. Not often enough to worry about, unless you’re doing graphic design for a rock band or an avant garde arts center. Last night we prevailed upon Jennifer — big puppy-dog eyes, and sniffles — so she posted her photos of the previous weekend’s festivities surrounding Margaret’s and my twenty-fifth anniversary. If you start here, you can click backward through the pictures until you see Mile running around the car — that didn’t happen last weekend. The way things have gone this year, I shuddered when I read Slate’s headline for a Christopher Hitchens story entitled, “My Beef With ‘Rage Boy’ ” — though a rhetorical cage match between Chris Locke and Christopher Hitchens would certainly yield some blood-curdling polemical piledrivers — but the article isn’t about that Rageboy. Whew! Margaret and I were probing the mystery of the different appellations for Thomas Aquinas’ major work this afternoon. Some sources give Summa Theologica , “Theological Summa,” and others Summa Theologiae , “Summa of Theology.” There are high stakes among Thomists, we gather, but we aren’t sure who lines up on which side, or why. That was startlingly provocative enough, but the illustration brought to mind Margaret’s and my dismay recently to discover that most of America plays beer pong by rules very different from the ones we knew back at Bowdoin. We played (not Margaret, who abstains from both pong and beer) with real table tennis equipment and very basic rules (hit cup, take sip; land in cup, drain cup). Evidently there is now a World Series of Beer Pong played by the decadent variant rules. O tempora, o mores! The other night as I was lying awake, my thoughts rambled about the popular-music trope of the “book of love.” There’s the Monotones’ classic single, of course (“Oh I wonder, wonder, who boo-pe-doo, who, who wrote the book of love”), but Elvis Costello invokes it in “Every Day I Write the Book” and Nick Lowe and Dave Edmunds recorded a single with Rockpile, “When I Write the Book (About My Love)” — subsequently covered by a number of performers. There was a band named Book of Love. Is there a traditional background for this motif? Biblical tradition alludes to a “book of life,” and there’s the “talking book” tradition to which my radio conversation partner Allen Callahan refers in his book’s title. Am I forgetting a “book of love” tradition from folklore? Did the Monotones give birth to what became an utterly convincing folk-repertoire metaphor? 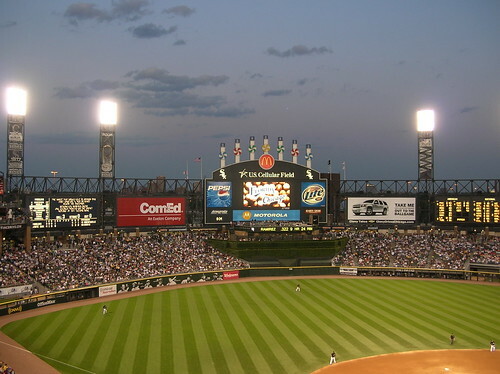 Tuesday night, the kids and I went to New Comiskey to see the ball game. We had a wonderful time, for the most part. The game was close, the teams played decent ball (especially considering how weak the Sox offense has gotten), and the game was tied going into the ninth, the beer was. . . golden. One drawback: the row behind us was a birthday group of girls Pippa’s age, who spent the whole first eight and half innings squabbling, shrieking, and slapping one another. We had to cover our years pretty much any time there was the least excuse for noise — or none. The most boisterous among them sat immediately behind me. In the first inning, she dumped her empty peanut shells down my back. In the third inning, she splattered her soda all over my back. In the sixth inning, she whacked one of her neighbors, who shrieked even more. Nate and I figured they’d tire out rapidly, but they were still squealing strong by the ninth inning. The only thing that silenced them was Dan Uggla’s ninth-inning home run, after which they decided the Sox didn’t have a chance, and the whole row left. Those last five outs were the best part of the game. Yesterday I wore my “I’m blogging this” t-shirt all day — and I didn’t blog.